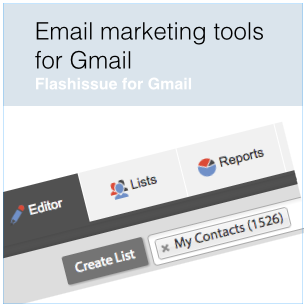 Unleash the power of Gmail as a full features email marketing platform. It designed for anyone to use and takes just minutes! Sending mass email with Gmail can be tough. 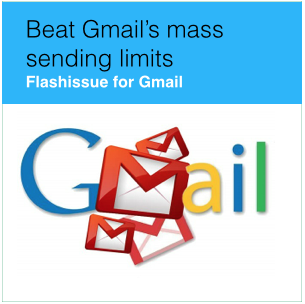 Flashissue provides a way to ensure you can still send mass email with Gmail and avoid Gmail’s bulk sending limits. Google imposes a maximum sending limit on emails of 500/day for regular @gmail users and 2,000 emails per day for Google apps users (this includes businesses and edu). In addition, there is a limit of 99 emails that can be sent in single mailing, which means if you try and send an email to 150 recipients using the To, CC or BCC fields your account will be flagged and you will not be able to send new messages (you can still access your account and receive incoming email). They wanted the URL so they could add the post to their email newsletter using the Flashissue curation feature. Getting people to give feedback on your idea or product can be daunting. Look no further than the free classifieds. You can use Craig’s List for free customer research. Funnel respondents into a survey – Use Google Form‘s as a free option. Gather and anlyze your responses. Tweak and repeat if necessary. *In a decent sized city you’ll typically get 200 or so responses. Using Craig’s List for free customer research was just one of the suggestions from the Google Entrepreneur Hang Out about “Lean Design Meets Design Thinking”. Have you recently asked yourself “where am I going wrong?”. Failure is a necessary part of business but are you failing unnecessarily? I want to share with you a blog post I wrote for Marketingprofs.com. It gives a perspective as to why you might be driving a stake through the heart of your business and how to fix it. It’s World Cup time so it’s time to have some fun. Download this spreadsheet and to start playing. We recommend posting it to your Google Drive and then sharing it with the people you want in the game. Players can open the spreadsheet, click on one of the Player tabs and enter their name and game predictions (avoid the tabs already in use by other players). Here’s 3 simple steps to write a 3 line sales email that closes business. Keep it “unfancy”. Making it look like a regular email from Gmail. Add some subtle branding to create an impact even if the recipient does not respond. Yesterday, I attended an online webinar from MarketingProfs called 10 Steps on Planning a Webinar (learn what a webinar is here) and afterwards I received a good 3 line sales email from the host. A webinar is an online web conference that allows people from remote locations to connect as a group using their computer, phone or tablet. Think of a webinar as an online presentation or discussion, that normally involves a single presenter relaying content on a specific topic to a group of people.